“Sister, you have not shown them the Catechism; they have to see the Catechism!” Such was the gentle reproach that Archbishop Marcel Lefebvre rather frequently made to the Sisters of the Correspondence Catechism when he came with guests to our motherhouse in France. Indeed, the Archbishop and his sister, Mother Mary Gabriel, (founders of the Sisters of the Society Saint Pius X) loved the Catechism by Correspondence very much. We could ask ourselves why. The answer is simple: missionaries by vocation, they were driven by the missionary spirit that was so deeply anchored within them by a whole missionary past. Both of them saw right away the influence of this work for the good of many souls. Archbishop Lefebvre, seeing very clearly the terrible consequence of ignorance, asked the Sisters of the Society Saint Pius X to undertake this work of the Correspondence Catechism. In fact, he wanted very much that the Sisters do it: it would be one of the means of carrying out our vocation as auxiliaries of the priests, and of reaching many souls. During the lifetime of our founder, the idea of a Correspondence Catechism by mail was unknown in Europe, though this system of homeschooling by correspondence already existed in America. The Archbishop came to know of it while traveling to Canada in 1982 where he met Sister John Bosco, a member of the Missionary Oblates of Mary Immaculate in Winnipeg. Her Congregation had begun a Catechism by Correspondence, which it later abandoned. Our Sisters, encouraged by the Archbishop to undertake a similar work, took inspiration from the English Canadian Catechism to develop their own program adapted to the needs of a generation which had practically no spiritual support. The first year of the new program appeared in France in 1984, developing over a period of ten years into seven levels with more than 600 individual registrations. This work being accomplished through the mail, it was not limited to one region or one country but reached many other French-speaking students in other countries, bringing spiritual help to families of various conditions, some being completely isolated from the presence of a priest. The program being well established in France by 1995, its translation into the English language then began. Thus it was that the first lessons in the English language were sent out from Browerville, Minnesota, in 1998 to about 90 young students in various parts of the U.S.A. who began this first level, Year A. Each year saw the program’s development with the addition of another level until 2007 when the program in the English language reached nine levels. The program’s development, however, has not ceased, since it is presently crossing another frontier, that of Germany, offering the same course to many families of the German language. Religious instruction must then begin in the family. Who will deny the primordial influence of the mother in the bosom of the home to produce, increase and maintain the flame of faith and piety in the souls of her children? The Correspondence Catechism favors and develops this family life. The young child needs his mother’s help to learn his catechism, and the lessons are the occasion to call and unite the whole family together. We rejoice to see that this Catechism answers the expectations and needs of so many parents. The Correspondence Catechism, of course, does not replace what would be given in a truly Catholic school where there is co-operation between teachers in the classroom and the parents’ guidance at home. The Correspondence program offers, however, a temporary solution and prepares the children for these good schools. We are thus happy to see several of our former students enrolled in schools such as La Salette Academy, Holy Name Academy, and others. There are also many catechism groups and small schools who purchase our lessons and homework to use in their curriculum. This Catechism does not contain any novelty of doctrine. Catholic doctrine is integrally expounded in it without change or modification. 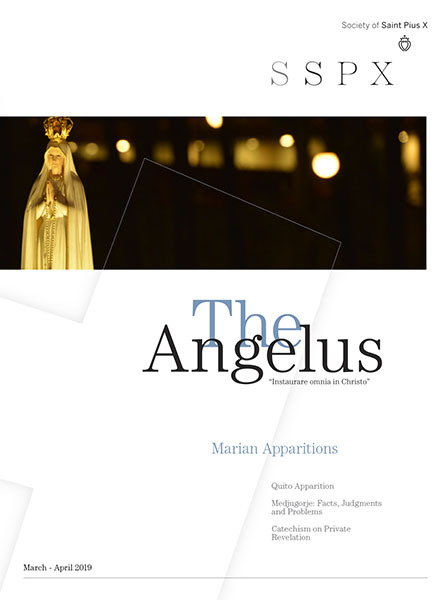 The efficacious traditional “question—answer” system has been used, and is the foundation and conclusion of an explanatory text with pictures, stories, and homework activities. Each level contains about 34-42 lessons, including a homework page as well as Advent and Lent projects. Let us take a quick look at the whole program which presently contains nine levels. The first three levels are particularly adapted to very young minds. Year A, the kindergarten level, leads them through the most basic notions of the Faith and gives them the knowledge of Our Lord Jesus Christ, the One who is the very center of religion and therefore of all religious instruction that is to be received in the future years. Year B introduces the child to the study of the Creed on a basic level, as well as accompanies him through the liturgical year with an explanation of the feast days and seasons as they occur. This Year, adapted to the first grade level (6-7 years old) may also be used in preparation for First Holy Communion; to this end, a First Communion Supplement is available which, together with this year, completes the necessary instruction for this sacrament. Year C, corresponding to the second grade level (or 8 years old), covers the Creed, the Commandments, and the Sacraments, and throughout the year, draws the child’s attention to the greatness and beauty of the sacrament of the Holy Eucharist as well as the importance of preparation for it, by stories, examples, and other means of encouragement. This level has been thus made in view of preparing children for their First Holy Communion, or of deepening faith in and love of the Holy Eucharist in those students who have already begun receiving this sacrament at an earlier age. Each lesson of these early levels also contains an activity suited to the child’s age—coloring, cutting and pasting, matching ideas, etc.—some work that will help him to spend a little more time assimilating the lesson learned. Besides a few questions or prayers to learn by heart, these first three levels provide some suggested questions for parents to ask their child orally about the lesson; these not only help the parents in their teaching task, but also foster discussion and aid the assimilation of the lesson. Starting at Year D (about 9 years old), the study of the Catechism becomes deeper, and, consequently, more challenging. From this point on, one full year will be given to the study of each part of the Catechism: the Creed (Year D), the Commandments (Year E), Grace and the Sacraments (Year F). Each of these levels, explaining its subject in depth, gives the student a thorough grasp of the subject matter and guides him in putting this knowledge into practice in his own life. Here, each lesson alternates with a brief study of the Old or New Testament, especially those stories which are linked with the doctrine being covered. In this way, the person of Christ is placed again at the center of religious instruction. The level of presentation of the material progressively becomes higher, to adapt to the maturity of the child. These higher levels also provide two semester tests per year. To relieve the intensity of these studies, two intermediate levels, D/E and F/G, have been introduced. Following Archbishop Lefebvre’s advice, the original course has been enriched by a year on the Christian virtues (Years F/G and G) which prior to this had not been treated, or had been very little developed, in other existing catechisms. The Archbishop deplored this absence, and he showed concern that our young students grow in virtue: “I hope that your apostolate of the Correspondence Catechism will develop and will help all these children’s souls to grow in the true Faith and in the virtues” (Letter of September, 1987). In asking us to compose a year on this subject of the virtues, the Archbishop gave us, as a fundamental book, the Summa Theologica of St. Thomas Aquinas—which was not easy to adapt to young intellects. It nevertheless responds to a present need clearly detected by the Archbishop. To help every soul of good will to imitate Our Lord Jesus Christ, it is necessary to bring it to practice the virtues, which is none other than the practice of the Christian life. N. has learned so much and loves corresponding with you....Your letters mentioning sacrifices and the Cross really helped her. She is very encouraged to carry her Cross thanks to you. I must say these lessons are excellent and very challenging. I grew up in the ’70s and never learned my religion like this! It is wonderful for me to learn. I’ve been given a second chance to learn about the faith. The illustrations accustom the children to what is beautiful by giving them a taste for it: “Your classes won us over by their presentation, quality, and the beauty of the drawings, the texts. Everything is made for the child and to give him the sense of what is beautiful....” They also efficaciously contribute to communicate to their souls marks of true piety due to the attitudes of the personages represented—reverence to God, to the Blessed Virgin Mary. The Sisters are happy to dedicate their energies to a work which is so necessary to the Christian life. How does the program work in practice? After the preliminary work of preparing the text, drawings, printing masters, etc., has been completed, there is the direct work of the apostolate, the contact between the Sisters and the families. Enrollments for the next school year start already in May. Then in August, the Sisters begin the work of preparing the individual packets containing the first few lessons and homework for each student. At the end of August—and this will be repeated during the nine months following—the Sisters fill each family’s envelope with the appropriate group of lessons and send them out to their destination. The students will then return their completed homework sheets about once a month. Throughout the course of the year, our “Correcting Sisters” can be found silently working at their desks in the Catechism room, concentrating on discerning the orthodoxy or, at least, the accuracy of our young—or older—students’ answers; or, for the littlest ones, it is the task of guiding them to put care into their coloring or pasting, since all must be done well for God! These careful corrections, together with a personal note for the child, will be sent back to the student on the next scheduled mailing day with a new set of lessons and homework to study. What about late enrollments, delays in returning homework, etc., brought about by difficulties of health, of work, and similar conditions? The Correspondence Catechism is flexible enough to work with these conditions. It can be started or continued again as soon as there is the possibility. At the beginning of this article, it was related how the Archbishop and Mother Mary Gabriel loved the work of the Correspondence Catechism and wanted its expansion. Today, when this work has reached an average number of 600 student registrations annually in France and 350 each year in the U.S.A., we remember their help and their advice with gratitude. The program owes its origin and development to our founders, and it is one of the fruits of their apostolic and missionary zeal. This work has, moreover, inherited the last teachings and examples of our founders, who wanted to pass on to us their missionary spirit. Indeed, Mother Mary Gabriel encouraged the apostolate of the Catechism and efficaciously worked with it when her declining strength no longer allowed her to do any heavy work. Her soul, still that of a missionary, could there expand again since she saw in it the continuation of her missionary work. Mother Mary Gabriel spent hours folding the catechism sheets with a smile. Her thumb became sore from sliding it across the pages so many times, but each day she began again as if nothing were wrong. Everything was completely given for God and the salvation of souls. The final end of every apostolic work is the glory of God and the salvation of souls. Thus it is for the Correspondence Catechism program. Turning the mind towards the True while giving it sure and precise knowledge of this truth, it directs the will towards the true Good, enlightening the choices that must be made throughout our short life here below—allowing us to live as men and Christians and therefore to attain eternal happiness. God wants this true happiness for every soul that He creates, and every soul attaining this end will glorify Him eternally. Nevertheless, it is certain that God, through His grace, is the most efficacious sculptor of these souls, and that is why during our hours of adoration close to Our Lord, our prayers are often for all our little students and their families.